Donovan McNabb, Tom Brady, Ed McCaffrey and so many other football players have all had the “athlete hernia.” Sometimes this is called the sports hernia or athlete pubalgia. But what is a sports hernia? What can you do about it and why does it matter? Unlike a standard hernia, a sports hernia does not involved your intestines leaking out through a hole in your abdominal wall into your scrotum. This is a very different injury. The reason it’s called a hernia at all, is because it is often misdiagnosed as a standard hernia, because initially, it presents in the same way. The word hernia means something coming out of where it is supposed to be and ending up somehwere where it isn’t supposed to be. In a true hernia, you intestines come out of your abdominal cavity, through a hole or canal and leak into your scrotum or into the area under your skin. This has the usual hernia findings. A doctor uses a finger to feel the hernia through the scrotum and sees if coughing makes it worse. If coughing makes it worse, it is a standard hernia. What if a patient comes in complaining of abdominal pain, says its hurts to laugh, sneeze, cough, or make sudden movements, but no hernia is felt? The doctor would be confused. The doctor may order an MRI or a CT scan, even a standard x-ray to try and find out what is wrong. It is a very difficult diagnosis to make. If the patient appears athletic and says that they are involved in sports, you must immediately think of a sports hernia. This is a very commonly missed diagnosis. So what the heck is a sports hernia and why does it feel the way it does? The term sports hernia or athlete hernia can be used to describe a number of different injuries. Since the pain and the symptoms appear similar, they are all lumped under the term athlete hernia. The athlete hernia commonly refers to a tear in the abdominal muscles near the groin where various ligaments and tendons attach. It can also refer to a tear in the conjoined ligament which is also located in the same vicinity. Athlete hernia can also refer to tear in any one of the muscles or ligament that are used to pull the leg in towards the body, the adductors. 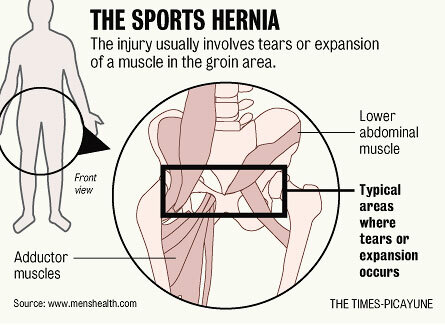 A few other tears in that area are also lumped into the sports hernia definition. How does this injury occur? It is more common in hockey and soccer. And it is more common in males due to their anatomy. The common mechanism is a player that is hunched over or kneeling forward, almost like trying to touch your knees with your hands, while running. You make a turn or spin and feel a strange sensation in your groin and belly. Usually, the player knows they have done it and usually you know when it happens. You can pinpoint it exactly. In a minority of cases, the injury occurs over time as a wear and tear injury and you may not be able to remember when it happened. Historically, it was always ice hockey players that had this injury, but now we see it more and more in football. We also have begun seeing this in flag football. Because a lot of players are hunched over while running, trying to elude would be flag-pullers, coupled with the fact that flag rules don’t allow you to dive or fall, you end up tearing these ligaments often. It hasn’t reached the epidemic stage yet, but we need to know what it is and how to handle it. How do you know if your player, your athlete or your kid has it? First of all, usually you can still play whatever sport you are playing. Your player will feel like they can still play. Usually, it is afterwards and after the games end that they feel the worse. You will notice them walking leaning forward, with a slight limp and not wanting to adduct their legs against force (pull their leg in towards their body). You may also see them avoiding laughter, coughing, and sneezing or holding their belly when they do so. Athletes usually have difficulty getting out of bed and doing straight leg raises. They feel sore after they have stopped playing, usually the next day when they wake up. The first thing you want to do is send your player to a physician and make sure its not a true hernia. If it is, it can be repaired surgically quite easily. The demographics of true hernias and sports hernias overlap, so it may be difficult to classify the injury as one or the other just based on the descriptions, both can affect young healthy males. If your physician is not sure what it is or is confused or has trouble figuring out what to do, it probably is the athlete hernia. It is a very difficult diagnosis to make. Once you know what it is, what can you do about it? How do you treat the athlete hernia? For most of us, the first thing you should try is conservative measures. This means anti-inflammatory medications and tons of rest. Stop playing sports and give it a rest. This may take a few months, depending on severity of the injury. Your physician can usually prescribe a strong anti-inflammatory medication like Naproxen. Not playing sports is the most difficult part, because usually you feel like you can still play. In fact, some athletes just take pain killers and manage to play pretty well. Unless you are an all star athlete and need to be back on the field as soon as possible, try to avoid the surgery route. Surgery usually effectively cures athlete hernia with a 97% success rate, but is not necessary unless you have a severe injury, or need to get back on to the field to make your millions. In most cases, rest and anti-inflammatories are sufficient and you will heal just as well. Playing through a sports hernia is difficult, but doable. Athletes can do it and have done it, but it is very painful. It does not restrict your game, unless it is very severe, it just hurts like heck. It is probably one of the most painful types of injuries to play through, but it can be done. Some movements are more painful than others; lateral movement, side stepping, twisting, kicking through a ball, and sit-ups are usually the most painful motions. Is it bad to play through this injury? Not in most cases, it’s just very painful. Can you cause more damage? Yes, you can, but it is not usual. Most athletes will eventually no longer be able to live with the pain and will stop playing. Yes, you can make it worse by not resting, and yes, you may end up needing surgery to repair this injury. Make sure you seek medical advice early on and see how much activity you can tolerate. We've been coaching and playing football since the 1980s. Many of our staff are highly specialized sports trainers, athletes, sports medicine physicians, parents, and coaches. We love playing football and love writing about football.